If nasal obstructions are keeping you from resting properly and causing snoring problems you cannot wait to solve, anti-snoring nasal cones may be the ideal solution for you. We can help you make the right choice by providing you with a side-by-side comparison of two well-known brands of nasal cones – SnoreCare and NasiVent Tube Plus. Scroll down to see our SnoreCare VS NasiVent Tube Plus comparison table and discover which nasal cones are more likely to take those snoring troubles away. SnoreCare nasal vents deal with the problem of restricted airflow by preventing nasal airways from collapsing. They are soft, easy to use, and most importantly, they successfully eliminate nasal obstructions, one of the most common causes of snoring. NasiVent Tube Plus is classified as a nasal dilator, addressing the issue of partially closed nasal passages. 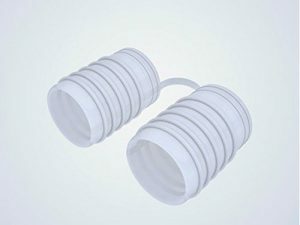 The tubes will support the nasal walls, especially the nostrils, and provide regular airflow throughout the night, resolving your snoring problems. SnoreCare nasal cones are highly durable. With proper use and maintenance, they should last for at least a year. SnoreCare nasal cones are made of soft, medical-grade silicone. They are free from BPA and made with an FDA-approved material. SnoreCare nasal cones are not customizable. However, they do come in 2 sizes – big and small. You can also decide whether you want to get ribbed or non-ribbed cones. Ribbed cones ensure a better fit. With SnoreCare nasal cones, it may take a few nights to get used to wearing the device. Snorers who have used similar devices before may get used to them immediately. SnoreCare nasal cones are designed to effectively open up nasal air passages and remove blockages caused by nasal congestion or a deviated septum. They can reduce or even eliminate snoring, particularly in light and moderate snorers. They can further help with sinus issues as well as swollen turbines, which are a common cause of sleep apnea. SnoreCare nasal cones require basic maintenance. They should be washed in warm water and mild soap after every use. After cleaning, leave them to air-dry before storing. SnoreCare nasal cones have no known side effects. Snorers with sleep apnea who want to use them as an alternative to CPAP therapy. SnoreCare nasal cones are sold through Amazon.com and come with a money-back guarantee. For information on refunds, please see Amazon's A to Z warranty. SnoreCare nasal cones come with a 1-year replacement warranty. NasiVent Tube Plus has a long lifespan. With proper use and maintenance, it can even last a lifetime, as stated by the manufacturer. NasiVent Tube Plus nasal dilator is made of 100% medical-grade, FDA-approved silicone. NasiVent Tube Plus nasal dilator is not customizable. Instead, it comes in 4 sizes: XS (7 mm), S (8 mm), M (10 mm), and L (12 mm). If you are not sure which size is the best fit for you, you can purchase the starter set, which includes 4 dilators, one in each size. With NasiVent Tube Plus, the adjustment period may vary, but it usually lasts several nights. NasiVent Tube Plus can significantly reduce snoring caused by obstructions of nasal airflow. It opens up the nasal passages from the inside and prevents them from collapsing while eliminating potential blockages caused by problems such as nasal congestion. However, the device is only effective if you achieve a perfect fit and if you are not a restless sleeper. NasiVent Tube Plus nasal dilator should be rinsed under warm running water after each use. You can wash the dilator in warm water and mild soap every week or after every use, as needed (depending on the presence of nasal congestion). Nasivent Tube Plus should not be cleaned with excessively hot water due to possible damage. Soreness/irritation caused by the insufficiently round edges of the device. Snorers with highly sensitive nasal passage walls. NasiVent Tube Plus comes with a 30-day money-back guarantee. For further information on refunds, please see Amazon's refund policy. NasiVent Tube Plus does not come with a warranty. Well-designed, comfortable, but didn’t work well enough for me. I really like these vents. They are surprisingly comfortable, I don’t even notice them and they fit well. I snore less, that’s for sure. Plus, the price is great. I guess it depends on what kind of snoring problems you have, but they seem really effective to me, at least for now. This is my first snoring aid ever. I finally came to terms that I have a problem that not only affects my health but also my wife's ability to rest throughout the night. The device itself is pretty comfortable and opens my air passages quite a bit. According to my wife, it apparently reduces snoring both in length and volume but doesn't completely eliminate it. I bought these after growing tired of constantly waking up to an empty bed. My wife would do to my loud snoring and go to sleep somewhere else in the house. Good news is, she hasn't left a bad ever since I bought them and they've really helped me reduce the volume of my snoring. I still snore somewhat but it's much better than before, according to my wife. It’s a good thing that Nasivent comes in packs of three or more cuz I already lost one pair. They work fine for snoring but they are a bit unstable up there. Luckily, Nasivent put out a new model and now it’s almost perfect. I still get a bit of a runny nose from these tubes but…something’s gotta give. SnoreCare nose vents are an effective snoring aid made of medical-grade silicone. The device gently opens up your nasal passages and allows you to enjoy quiet, snore-free nights. Read more in our expert review and SnoreCare reviews from our readers.